“So delighted to find you folks upon googling,” the message begins. It arrived at my webmail box at the beginning of July, written by a woman from rural Anytown, Everystate, USA. The impetus for her message was an upcoming pig wrestling event at a local fair–complete with human spectators who would be, in her words, “guffawing and smiling all the while–unbearable!” Her concern was a lovely and oft-needed reminder that compassion–like speciesism–lives everywhere. …they will eventually be left behind by our evolving humanity as we pursue and gain increasing justice for animals. Reach the ones you can–the fence-sitters, the ones who are compassionate but unaware, the ones who need someone else to speak up first…those are the ones we need, and if you’re willing, you’re the one to speak to them! Turns out she didn’t really need me or this advice–she later revealed that three years ago she had helped lead a campaign against the extermination of 250 Canada geese whose presence became inconvenient to some homeowners in a lakeside community. (Geese–on a lakeshore? Outrageous!) The plan to “euthanize” (read: kill) the birds was scrapped when protests erupted and a Squawk Back! Facebook page garnered attention and support for the cause. You go, girl! But you know how it is. You’re up to your neck in factory farming, predator persecution, shark finning, horse slaughter, puppy mills, captive marine mammals, zoo-circus-rodeo abuse, coyote killing contests, goose and urban deer slaughter, fur farms and trapping and trophy hunting…and along comes something as stupid and mean as pig wrestling, touted as “great family fun!” And if you don’t take it on, who will? 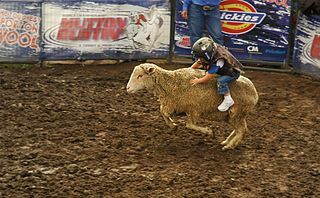 Or maybe it’s mutton bustin’ (video), where small kids hang on the backs of frightened, docile prey animals, learning how to cowboy up for their awesome future wrenching the necks of steers (video) and clotheslining calves (video) in the rodeo arena. What’s the lesson in these “contests”? That “conquering” animals makes you a winner? That empathy and compassion are for sissies? That causing animals emotional and physical distress is inconsequential? Even though…conveniently provided hand sanitizer dispensers will prevent swine flu after the pursuit of one traumatized pig after the other… We wonder what the animals could catch from us wrestlers. Nightmares? Torso damage? Broken limbs? Aborted piglets? Yep, we opt out — in every way. Doesn’t sound fun at all. Sounds abusive and cruel. Of course, the show went on, but her words broke the silence that grants exploiters tacit approval for their mistreatment of animals. And just as she might have felt validation and support upon finding the Other Nations pig wrestling page, she in turn provided the same validation and support for other compassionate people who read her letter. Perhaps some of them will be emboldened to add their voices to hers next time around. Thank goodness for all the Susies and Kathleens. Small injustices and large injustices — all injustices heaped upon animals — arise from the flawed legal premise that nonhumans are property possessed by humans. Someday that imposition on our concept of justice will be swept into the dustbin of history. THANK YOU, Kathleen and BlessUsAll…I wander about — all day long — having fun with and taking care of my household “pets”, and I prowl Facebook to help virtual nonhumans (I love THAT term, BlessUsAll!) At last, I do feel validated reading through this beautiful piece of writing which I shall always treasure. More thrilling for me, though, is that the sentient beings (and a host of others “who” came to mind as I read) mentioned by Kathleen are featured in a perfect message any reader can understand. Of course, I delight that countless folks will be subsequently recruited to this noble cause, i.e. joining those of us who are fostering true respect for and reverence for all beings who inhabit this planet Earth! I am honored to be included with those exceptional sentient souls mentioned in this magnificent article! For the moment I have felt the pleasure of having landed in heaven itself! beautiful tribute to people like my mom and those other selfless souls who pour their hearts and souls into being fierce voices for the voiceless. and thank you for this wonderful blog and for all your exceptional advocacy! As always – Thank you for your life-affirming and compassionate way of bringing the ugly truth into the light of reason ! Poor old beaten-down sheep…the “mutton bustin'” events are, I’m imagining, their last “use” before going to slaughter. Just a bit more “fun” for the good ol’ boys before being ground up. 😥 I cry every day…but then I live in the clueless Midwest where these happenings are so common. Tragic!